Emergency Preparedness for your pets. 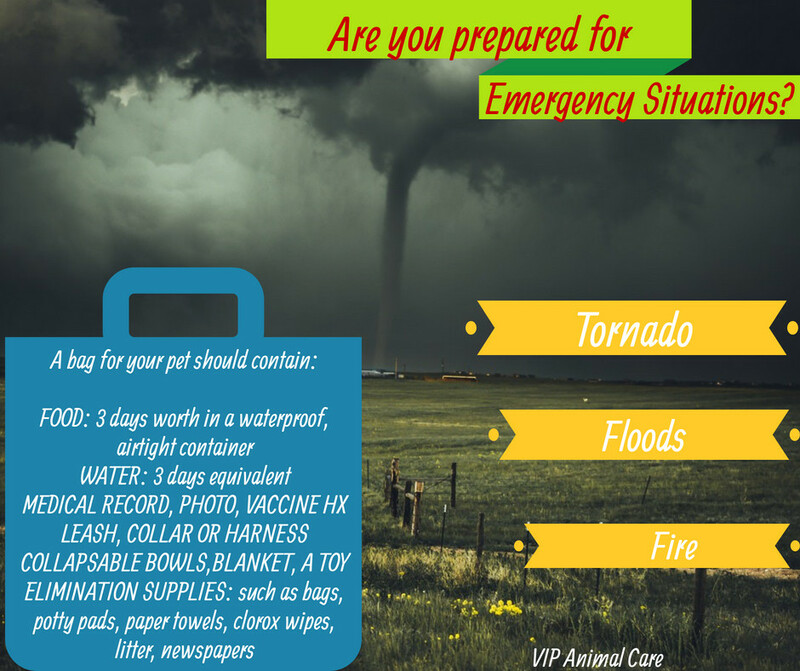 Have you thought of what your pet would need in an emergency such as tornado, flood, etc?? Being prepared should a time arise will eliminate extra anxiety in an emergency. Pets are part of our families, but they have a different set of needs than we do. The last thing you need is to have to substitute your pet’s food because you can’t locate their particular kind. My pets eat a prescription diet, so it is very important to have their brand on hand. The secondary problem from a sudden food change is upset stomach, diarrhea, etc. Creating a bag just for your pet that is kept in a closet clearly marked that can be grabbed quickly in an emergency will alleviate any extra anxiety for you and your pet. Mark it clearly, so anyone in your household or emergency personnel will be able to grab it easily and quickly.